I'm working on a new version of a data analysis for robotics competitions. 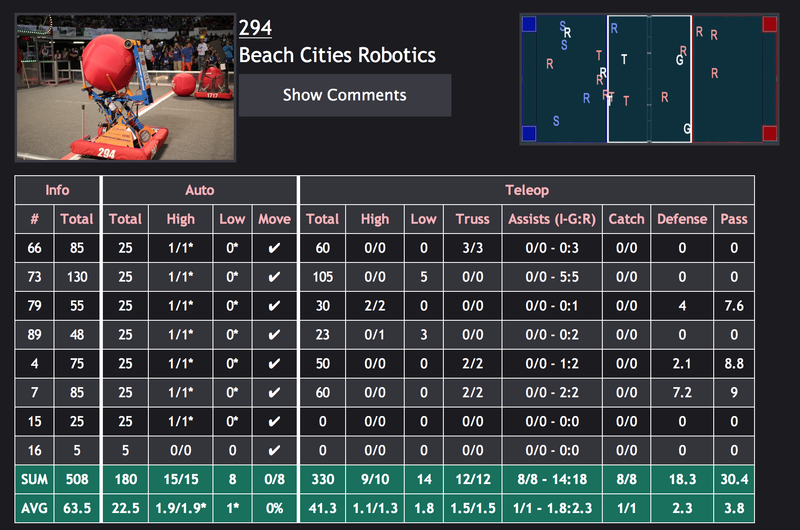 Among other things, I'd like to make it easier to view complex match statistics that are collected on each robot. Currently the approximately 20 data points per match are displayed in a table (see below). Above to the left, is a picture of the robot, the team number, and the team's name. To the right are a set of locations at which the robot performed certain actions – for example the S represents shooting locations on the field (this is used to help plan defensive strategies). This data is used to help compare teams for team selection (think like a pickup game of basketball) and plan both offensive and defensive strategies. I want the data to be more accessible and easier to interpret without scanning down columns of data while, at the same time, leaving as much data visible. I can't graph every metric together as they all are scaled differently. One idea I've been playing with is graphing the data metric at which they excel (figured out by ranking) and displaying that graph instead of the table. In this UI each column heading would become a tab which can be used to toggle the displayed chart to a new metric. The current table could be viewed by clicking a button above the graphs. Does anyone have any ideas on how I can make this data easier to interpret and view? I don't want to cut the amount of data shown, but I'm afraid its intimidating to users. What should I do? This is a pretty difficult question to answer, so I think the best thing is to give you some ideas to think about. The process of designing interfaces for the purpose of data visualization is a whole subject area in itself, although you'll find plenty of good areas to start with from the likes of Edward Tufte and Stephen Few. Consider the content and structure of the information, so that you don't show everything at once but allow the user to create the context through a series of search and filter that then brings up the detailed dataset. Hope it helps, but if you want some critique or suggestion on anything that you develop then feel free to ask more questions. One application of radar charts is the control of quality improvement to display the performance metrics of any ongoing program. They are also being used in sports to chart players' strengths and weaknesses, where they are usually called spider charts. Not the answer you're looking for? Browse other questions tagged tables data charts data-analysis or ask your own question. Interface Question for Showing Tabular Data? What are the fundamental Metrics in a data-driven design? What is a good way to position chart elements on a dashboard? What is the best way to show “Average” and “Max” of data usage per network in a chart?